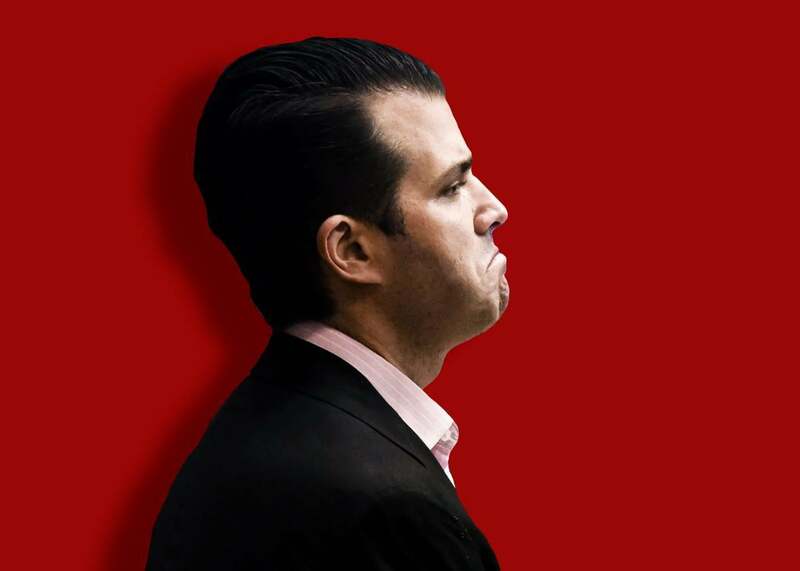 Donald Trump Jr. isn’t guilty of treason, but he likely committed this other crime. Is Donald Trump Jr. Guilty of Treason? Probably not, but he likely committed this other crime. Donald Trump Jr. on Nov. 15 in New York. Photo illustration by Natalie Matthews-Ramo. Photo by Timothy A. Clary/Getty Images. Today, like many days during Donald Trump’s tenure as president, the question for the lawyers is: Are we there yet? While there are certainly pundits, among them George W. Bush’s ethics czar Richard Painter, saying Trump Jr. is on the hook for treason, that seems unlikely. Treason against the United States, as defined in the Constitution, “shall consist only in levying War against them, or in adhering to their Enemies, giving them Aid and Comfort.” Nobody I spoke to on Tuesday was talking about treason. (2) a person to solicit, accept, or receive a contribution or donation described in subparagraph (A) … from a foreign national. This law regarding “contributions and donations by foreign nationals” bars candidates and their associates from “soliciting,” accepting, or receiving anything of value that would benefit their campaign from any foreigners. According to most of the folks I queried, it now appears the elements for a criminal violation of this statute have been met. Noah Bookbinder, the executive director of Citizens for Responsibility and Ethics in Washington, agreed as to the fundamentals. “As new facts emerge, particularly the emails released today, there is increasing evidence supporting the conclusion that Donald Trump Jr. and perhaps others in the Trump campaign may have violated federal law, including the law prohibiting soliciting a foreign campaign contribution—in this case a contribution of valuable information,” Bookbinder told me via email. The lone dissenter among the legal experts I canvassed was Stanford Law School’s Robert Weisberg. In an email, he balked at the idea that a “thing of value” as spelled out in 52 U.S. Code Section 30121 could be stretched to cover what Trump Jr. did here. I could imagine the statutory argument that “thing of value” can extend to damaging oppo research. But I don’t think there is much precedent for it. Most of the “[any]thing of value” precedent has to do with bribery cases … and while the courts allow some flexibility beyond actual cash or easily monetizable value, it has to have some economic salience to it. So, for example, offers of political endorsements or log-rolling tend to fall outside the category. So the case could be made, but it’s a stretch. What does this all mean for Donald Trump Jr.? At minimum it means that someone with a broad definition of the statute has the basis to think a crime has been committed and that Robert Mueller has even more on his plate as he investigates the scope of possible collusion. As “nothing burgers” go, this one looks like a whopper.